The Piklopedia, with the Louie's notes button ( / ) visible at the bottom-left. Like Captain Olimar, Louie takes notes too, but his notes are about how to cook enemies. To read them, the player must enter the Piklopedia and press / while on the desired entry. While Captain Olimar's notes would be useful to a scientist or biologist, Louie's would be useful to a chef. Interestingly, Louie references ingredients found on Earth (cultivated in oxygen). These ingredients could not possibly be known by Louie, as Hocotate has a severely different climate. This is most likely because Hocotatian plants often have a similar appearance to those found on Earth so Louie uses the names he is familiar with for a completely different plant. Some of his notes say that the creature is inedible, like the clover. In these cases, he states a humorous side effect of eating one. Louie's notes are not available if there is no saved game data for Pikmin 2. 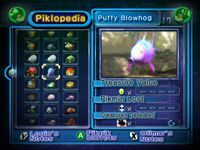 When the player defeats the Titan Dweevil and brings the King of Bugs back to the Hocotate ship in any saved game slot, a global flag is set on Pikmin 2's save data that enables Louie's notes. This means that from that point on, on any saved game slot, Louie's notes will be available to the player, even if the slot used to unlock this feature is deleted. It can also be noted that when an enemy is added to the Piklopedia, it comes with Louie's notes (although they can still be temporarily inaccessible as per the rule written previously), regardless of whether Louie is with the player's crew or not, in that saved game slot. The following notes conflict with the way enemies die in-game in some way, most often because the beast in question leaves no corpse. The Fiery Bulblax extinguishes itself upon defeat, but Louie's notes use the beast's flames as a cooking aid. The Careening Dirigibug's air sacs pop upon defeat, but Louie suggests them as a garnish to the dish. The Waterwraith is notable for not only not leaving any corpse, but its physical form being anchored to another dimension. The following creatures are said to be inedible in any capacity by Louie. The Doodlebug has no cooking tips and is suggested to be inedible, but is not outright stated as such. The Ivory Candypop Bud is not suggested to be inedible, but spoils upon seconds of picking. The Raging Long Legs, like the Doodlebug, is not outright claimed as inedible, but Louie's suggestions imply that it probably shouldn't be eaten anyway. Artwork of Louie from Musings of a Sidekick. On June 18th, 2009, Nintendo of Europe released an article titled "Louie's Notes: Musings of a Sidekick" at its website. It is essentially a humorous commentary written from the point of view of Louie, comparing himself and Olimar to other famous Nintendo duos (Mario and Luigi, Donkey Kong and Diddy Kong, Link and Navi, Pikachu and Pokémon Trainer), as an attempt to promote the New Play Control! edition of Pikmin 2. The website can be found here. “Take Mario and Luigi, chances are you've heard of them, the Italian expats in the Mushroom Kingdom? Luigi's never had a chance really. He's lanky and clumsy and his rotund brother always gets the spotlight, just because he was around sooner. In the good old days Luigi was happy to try anything (as long as Mario did it first); nowadays he gets overlooked, never gets the girl and is always compared to his brother's success - even though he can jump higher! Maybe it's because he constantly manages to get himself into trouble, but just think, it must be hard to be the gormless, elongated one who always needs saving. Or gets left behind. “Then there's Donkey Kong and Diddy Kong: these guys aren't killer gorillas, they're amiable apes who take it in turn to save each others' behinds all the time. Once Olimar and I have more adventures under our belts I figure he'll need saving sometimes too. “But, when it comes to iconic partnerships, the story of Link and Navi's epic adventure with the Ocarina of Time even made headlines on Hocotate! This duo prove that how big you are has nothing to do with how noisy you can be! He's a big green monosyllabic lug; she's tiny but probably the noisiest sidekick ever! She's all 'LISTEN! Here's some really useful information on your enemy!' or 'LISTEN! Did you notice that thing you blatantly didn't notice yet?'. “Olimar and me, we're just good looking rebels thrown together to save the world... from a crippling debt brought about entirely by factors beyond my control. But, we've already got the thing that makes all of these duos special: we're great friends, and Olimar at least understands what's going on when he's told to 'press A', whatever that is. This page was last edited on April 14, 2019, at 10:42.